The road up to our house runs in a crescent shape from the main road at Guarenna down to the road to Selva Piana. The main section of road up to our hamlet of Guarenna Vecchia was pitted with potholes until last Christmas time when repairs were made to it. The section down to Merosci and Selva Piana is a single, serpentine track, that produces the occasional stand-off when two cars meet. 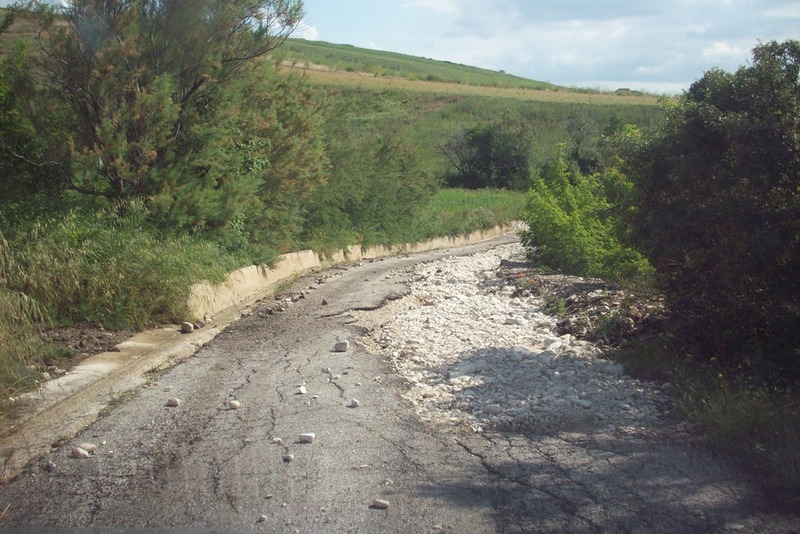 The recent storms have created havoc with our road, on Saturday so intense was the rain that it caused damage to the road, all of the recent repairs were washed down towards Guarenna, causing more damage as the debris tumbled downhill. Add to this the mud slide that occurred and we have on Sunday morning a road that’s impassable. Now it being a Sunday doesn’t really pose a problem, but Monday morning the school bus will be heading this way and should it manage to navigate through the debris and newly opened potholes; some the size of a Fiat 500, it’ll never get through the mudslide. At lunchtime, I’m enjoying a glass of red with my focaccia and wedge of quartirolio (a delicious feta style chees from Lombaria) when I hear an engine revving furiously. 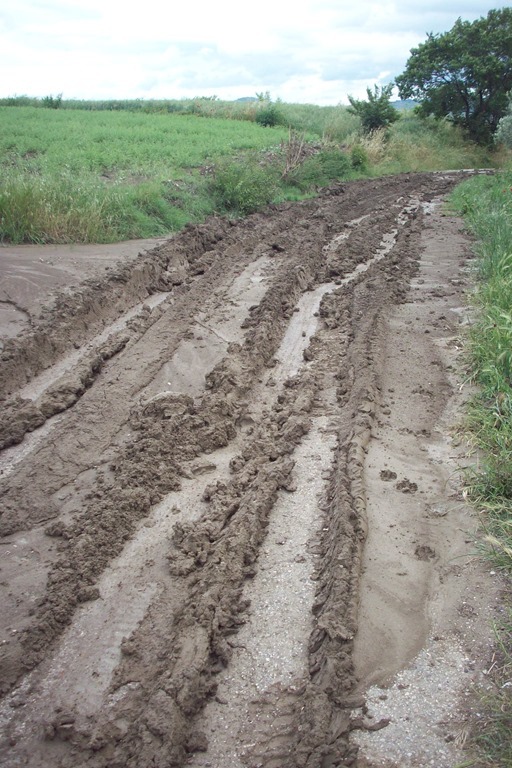 I investigate the noise and looking down the lane I see a car sat in the middle of the mud, wheels spinning, sending mud up into the air behind it. I shake my head, wondering who would be daft enough to attempt to drive through the brown lake and go back to my cheese and wine. Later a 4×4 rolls up and makes a track through the mud and then as it passes, it deposits the brown gunk stuck to its wheels just outside my house. Now this track is taken advantage of by the teenager down the lane, as he can now sail through the mud on his Vespa navigating his way through the tyre tracks. Throughout the day several more cars venture up the lane, but all abandon their endeavours and turn back. Wednesday comes and we enjoy an afternoon with friends at Lido Le Morge, (it was even warm enough for a quick swim in the Adriatic) and when we return there are warning signs and a 10km sign in place at the bottom of the lane. It looks like work may begin to repair the damage, but this being Italy, that may be piano,piano – who can guess when. Oh me of little faith. Thursday morning arrives and with it the tractors to move the mud, and a road closed sign, who knows, maybe they’ll repair it once again. Only time will tell. Friday morning update: Just had a trip down the lane and the potholes have been filled in, I wonder if the one’s back home in the UK have? Growing up in the UK I lived in a semi-rural location. I was lucky enough to play in fields, help out on the local farm and as a teenager earn money stacking turves destined for the new housing estates being built in the 1970’s. The first thing I had to tell myself, when I decided that this was the house I’d like to live in, was that I have to get used to the not so pretty of creatures that inhabit the land. The wee beasties that crawl and fly and buzz and sting. Now, I’ve never really been very good with bugs, but this said I’ve always had a live and let live attitude. I’m quite happy to live in a house with a spider, just as long as the spider doesn’t want to walk over me. With the exception of mosquitos and ants, I usually take visiting critters back outside. Who am I to say that just because it’s not easy on the eye or creepy looking it should be stamped upon. This week I’ve been visited by some wonderful creatures. On Monday morning the iPod shuffled and Tiziano Ferro started to sing La Differenza Tra Me e Te (Stefano Maneo Remix) and I spotted an enormous spider trapped inside the washing up bowl. It was desperate to get out, but it’s legs could find no purchase on the sides of the plastic bowl. So I removed it and set it free among the rubble from the restoration, where there’s plenty of hiding places for it to lie in wait for unsuspecting flies. 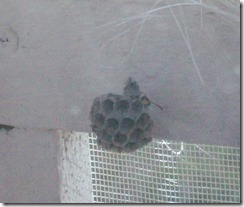 Tuesday, I noticed a small wood wasp, she was building a nest inside the old window frame in the kitchen. She was a delicate little thing, and when she flies her longer back legs dangle like stilts. 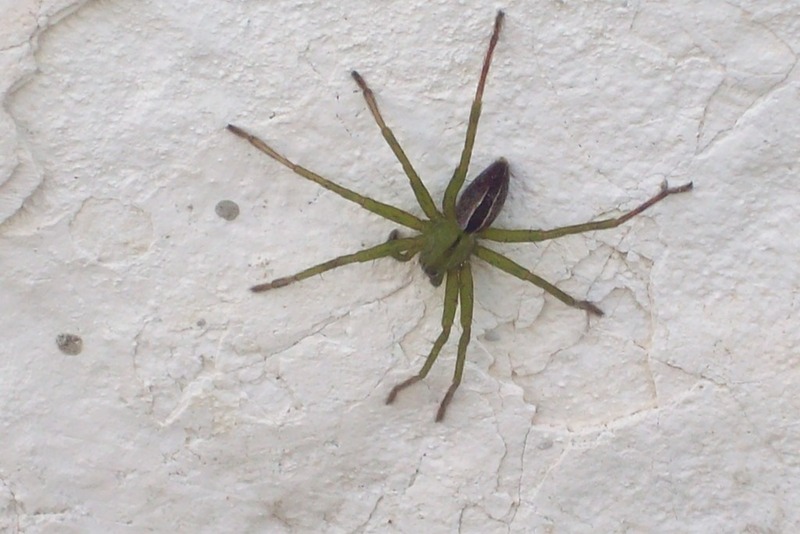 A visiting friend said I should kill it and remove the little nest that is the size of a one-euro coin, but I refused. She’s doing no harm, I don’t need to open the window, and I know it’ll not get much bigger than it already is. She just needs somewhere safe to lay her eggs, and despite her vicious looking sting, I know she’s more afraid of me than I am of her. Wednesday, because the doors and windows in the living room were open we were plagued by flies, but a quick squirt of insecticide spray soon put pain to there foray into the house. 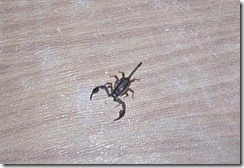 And Friday, we had our first visit of the summer from a scorpion. I was just about to sit down for my dinner when Dutch said, “What’s that on the floor?” I looked down and a magnificent black scorpion was making its way over towards the darkness created by the heel of my Ted Bakers in the corner. So I soon snapped a quick photo, the flash causing it to scurry to the relative safety of my shoes and armed with card and plastic tub, I removed the visitor and took it back outside, where it scurried off into a dark crevice beneath the house. This is, however, only the beginning, as summer progresses we’ll have the mantis and the grasshoppers to contend with, not to mention the dreaded mosquitos that will be on the attack. Maybe it’s time to start thinking of getting some fly screens made in readiness.